The date of the GB and I team announcement for the June Curtis Cup match against the Americans at Dun Laoghaire GC, nr Dublin is fast approaching - after the Helen Holm Scottish women's open amateur stroke play championship at Troon in April - so the pressure is on selection candidates such as Wellingborough's Meghan MacLaren, a student at Florida International University, to produce good tournament results to improve their prospects of (a) automatic selection through the World Rankings of the LGU Order of Merit, or (b) gaining one of the two wild card selections by the LGU Selection Panel. 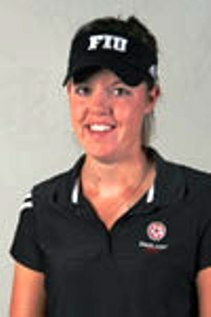 Meghan, pictured, who is in the Europe team, alongwith Olivia Mehaffey, to play Asia Pacific in Portugal next week, has started off well enough in this weekend's big US women's college tournament - the Notre Dame Clover Cup at Longbow Golf Club, Mesa in Arizona. MacLaren opened with a two-under-par 70 to be lying fifth, three behind leader Brooke Graebe (Texas Christian). Meghan's Florida International team-mate Sophie Godley from Notts did not do so well with an 81. Ariana Coyle Diaz from Dublin, a student at Penn State University, shot a 75 for a share of 34th place. Texas Christian (284) lead from Southern Methodist (285) in the 17-strong team contest. Florida International (296) are in sixth place. Early days.